Case Interview Prep – How to Ace the Case? No candidate passes the consulting screening process without acing the case interview. Consulting firms use this interview to assess whether you have the ability to analyze and resolve a problem logically. For candidates like you, it’s the perfect opportunity to prove you have what it takes to be a consultant. Below are some key case interview prep techniques that will help you ace the case. If this is your first time sitting for a case interview, conduct research on how the test is administered. Most firms explain the process on their website and even post sample cases. Another option is talking with people who have undergone the process and who can help you ace the case. They can explain how interviewers present the problem, answer your questions, and evaluate your answer. Your in-depth understanding will help you during the actual case interview. 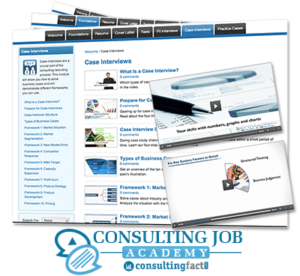 Learning various consulting frameworks is another effective case interview prep technique. Utilizing a structure allows you to deal with the ambiguity of the dilemma because it shows you how to break down the case into manageable chunks, understand each factor, and arrive at a sound conclusion. With a framework in mind, it will be easier for you to ace the case. Yes, this type of interview has time constraints, which can cause anxiety if you don’t know how to ace the case. You will be confronted with numbers during the case interview. Depending on the dilemma presented, you might have to add, subtract, divide, or multiply three-digit numbers or calculate percentages. You may do this manually, but if you want to be more efficient and impressive, perform the computations mentally. To perfect this strategy, try answering Sudoku and other math puzzles during your spare time. You can also pay attention to the numbers around you—the price of goods in grocery stores, your monthly expenses, or current stock prices. Finally, practice reading and interpreting charts and tables without using a calculator. “Practice makes perfect” may sound like a cliché but it has always been an effective case interview prep technique. Before the case interview, analyze as many cases as you can. Examine marketing, product development, pricing, strategy, operations, and other cases common to businesses and organizations. There are plenty of free resource materials on the Internet. If you’re still a student, seek assistance from your career service center. You can also browse our website, have a look at our ebooks or the online course. They can all help you to ace the case. One more case interview prep technique is conducting mock interviews. Find a friend, partner, or professional who is willing to represent the interviewer. Let him or her present the case and ask you several questions. After the interview, ask your “interviewer” to provide constructive feedback not only on your answers but your gestures. Communication isn’t only about constructing sentences; you can send strong messages through your nonverbal cues. Make it a point to talk to the interviewer with confidence and certainty. Would you like to learn more case interview prep techniques? Download our free management consulting career ebook. It teaches you how to physically, mentally, and emotionally prepare for the challenge and discusses the different types of cases you may encounter during the interview.